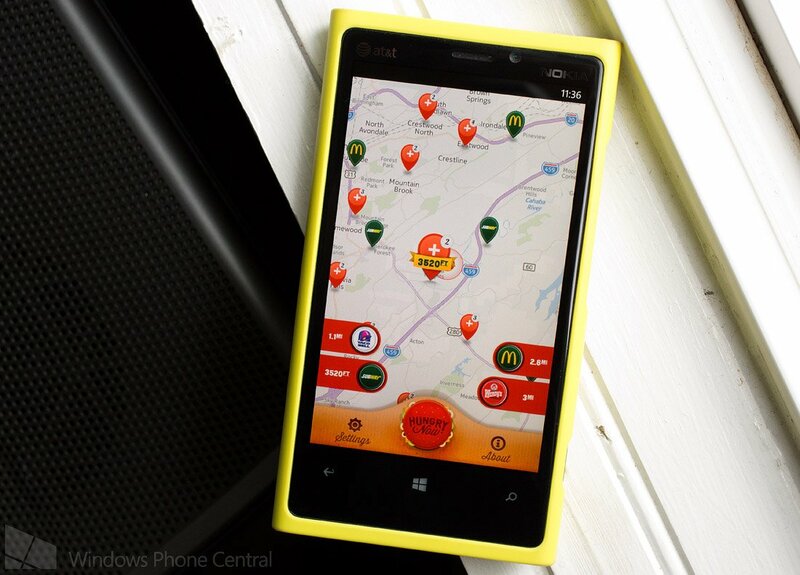 Hungry Now is a simple fast food finding app for your Windows Phone. It's an app that can come in handy when you're traveling or when your stomach is growling and you need to find fast food fast. Hungry Now will help you locate worldwide locations for McDonalds, Quick, Kentucky Fried Chicken, Starbucks, Subway, Taco Bell, In-N-Out Burger, Burger King, Carl's Jr., Dominos Pizza, Dunkin' Donuts, El Pollo Loco, Fatburger, Jack in the Box, Johnny Rockets, Pizza Hut and Wendys. Hungry Now is designed fairly simple with your main view being a map of your current location with details about your preferred fast food restaurants along the bottom sides of the map. Along the bottom of the screen you can access the app's settings and view the about screen. 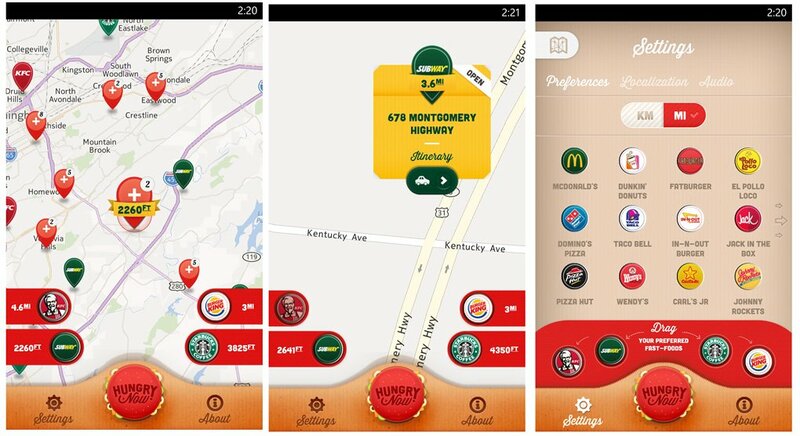 Hungry Now's settings allows you to identify four fast food chains as your preferred establishments. These four chains will be displayed on the main map. Additional settings cover distance options (miles/kilometers), turning on/off location services, and audio on/off. The preferred tabs on the map view will show the distance to the closest such eating spot. Tapping on these tabs will hide those preferred listings on the map. Tapping the Hungry Now button centers the map on your current location. Fast food joints not on your preferred list will show up as pin points on the map. Just tap on the pin to pull up the particular information about that fast food location. The information bubble will off you options to generate driving or walking directions. The directions aren't generated within Hungry Now but instead are done through one of your navigation apps on your Windows Phone (Nokia HERE, NAVIGON, etc.). All totaled, Hungry Now is a very nice app. I can see it coming in handy while traveling when you're looking for a particular fast food spot. Hungry Now is a free app that you can find here in the Windows Phone Store.